Get the most out of your markers! 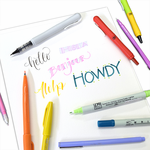 Over time and with heavy use, marker tips can become damaged or dried out. Use replacement tips to keep your marker working like new! Or take advantage of markers that have same-size interchangeable tips! Your same pen could be fine tip for one project, and brush tip for the next! Some markers are also refillable so you always have a full supply of ink!